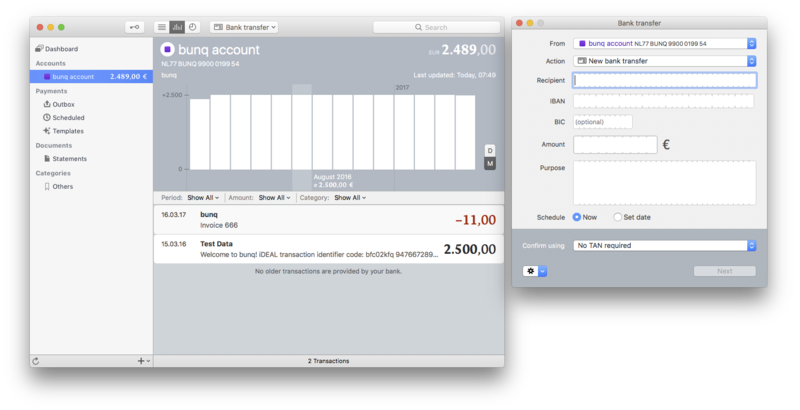 As a user of MoneyMoney.app (https://moneymoney-app.com - a banking app for macOS that supports multiple banks) I would love to see my bunq statements in there too. Currently that is not possible because of the fixed IP requirement and that we have to whitelist the IP for the API calls. As the app runs on my macbook behind a dynamic IP connection (ISP forces an daily reconnect, so the IP changes regularly) I would have to update the used IP before each connection. Please add an option to create API keys that don't enforce the fixed IP requirement. Thanks for your input ! Say if we drop the requirement for a registered IP that will mean that if somehow you lost your API key to somebody else, they have full access to your account. That is something you don't want to happen and is why this requirement is implemented. - use a vpn (virtual private network) which has a static IP. thanks for the answer. I think thats not a good solution for all cases - especially if you are mobile. Think about apps on iOS/Android without an backend server, or as said above, apps on the computer of the users. In these cases the connection doesn't have to go over an intermediate (proxy) server of the application developer - the client applications themself could talk to the bunq api - if we don't have the fixed ip requirement. A nice example for this is the bunq android app - the same problem exists there if someone would decompile it and extract your api key. The security of the key always depends on where the communication with the bunq api is happening - as you say in the bunq api terms. With the current bunq app we have a couple of more layers of security. think of your pin code, 4F authentication and passphrase. So, just a 'decompile' of the app will not work to fetch the api key. I agree with Maximilian. Actually, it would be more secure if my local app is able to connect with the bunq API directly instead of a proxy server or the server of some developer that I would have to trust. Therefore, I do also support the drop of the fixed IP requirement. Alternatively, you could provide an option to create "special" API keys that do not force you to login from a whtielisted IP adres. For users who know what they are doing. You said "think of your pin code, 4F authentication and passphrase" – sure, the 4F authentication probably cannot be handled by the 3rd party local app, but PIN and passphrase could also be provided via an API call. When having a service on Microsoft Azure, we cannot guarantee that the ip keeps static. Though the IP does not change often on Azure, there is a certain risk that suddenly that IP has changed and we have no means to change that. Even when we buy a static IP in Azure, we need several for swapping production code and testing new code. This would mean three IP's. A pre-release version of MoneyMoney with support for the bunq API is now available from https://moneymoney-app.com/beta/. Could DDNS instead of fixed IP-address be a solution? And how does it do that? Do I need to add my IP at bunq? The argument that a Fixed IP Requirement (FIR) will protect you in the case that somebody acquires your API-key looses further validity if you think about the possible scenarios in which it would actually protect you. Case 1: Somebody gains access to my computer and steals the API key. The FIR will only protect me if my computer is not currently (or sometime in the future, which is highly unlikely) connected via the fixed IP. Attackers could otherwise run a script on the already infiltrated computer and move the equity without being hindered by the FIR. Case 2: Somebody acquires my API key from a different location than my computer (e.g. accidentally uploading it to GitHub). In this case the FIR would protect me, assuming that the attacker does not proceed to infiltrate my network from which she could again run a script and move the equity. I don't know why, but I made a Flow Diagram for this. See attachment. In general, I think that there are better ways of protecting access to the API than having a Fixed IP Requirement. The requirement itself is not really save and results in a rather unbalanced security vs. convenience analysis. I'm using a vpn with a static IP Adress. To prevent my VPN Server from traffic which must not use the VPN connection I have a router that decides on the destination IP Adress to use the VPN Tunnel or directly the landline connection. Is there a documentation which IP Adresses or which IP Range is used by the bunq API? In this case I would be able to meet your limitation to have a static IP Adress. I'd say your second example is precisely why the fixed IP requirement exists: to save you, the developer, from mistakes like uploading your API credentials to GitHub, or having your laptop/USB drive containing them stolen/lost. Other than that, for read/write API credentials, I'd say the more security the better, if it's about my bank account! For read-only credentials one could relax the IP requirement. MoneyMoney is a banking app for macOS. Version 2.2.17 has just been released with official support for the bunq API. Getting account info, account balance and transactions. Getting list of scheduled payments and standing orders. @Michael: Your current IP address is automatically registered by bunq during account setup. Hi, I just saw in the update release note on Google Play that we can now "use the api key from any IP address". So the static IP address requirement has been dropped?